Cats enjoy being outside, but the outside world also poses significant known dangers and hazards that can harm and even kill your cat. An indoor/outdoor cat can easily be made a totally indoor cat with perseverance on your part. They may resent their confinement for a short time, but they will adjust. Many cats live their entire lives without ever setting foot on grass. The difference in their life expectancy as well as quality of life speaks for itself. Choking on cat collars – getting caught on fencing, tree branches, posts, etc. There are so many obvious benefits to keeping your cat indoors. Indoor cats are no less happy than outdoor kitties. Save your cat’s life and health! Your cat can fulfill his or her desire for the “outside” without the dangers of cat fights, dog attacks, attacks from raccoons or coyotes, toxins, cars, irritating your neighbors, or poisonings. Behavior problems (such as spraying or urinating) will lesson. You save on expensive vet bills. Most importantly, by providing a happy, safe and practical environment, you are ensuring your cat has a chance to remain your loving family pet for a much longer life. And, kitty might just “get along” better! Enclosures can be partially or fully covered; large or small; seasonal or year round; permanent or temporary. If you rent, you can plug the holes easily when you move, or maybe the landlord would want it for another renter. Enclosures can be constructed inexpensively and can also be added to over time. The basic materials needed are 2x4s or 2x2s, and 1×2” galvanized wire or chicken wire. The frames base can be “nailed” into a cement patio, or, you can drive the long studs (nails) into a dirt floor or grass. Location – Where do you want the enclosure to be? You can build off an existing window, door, patio, or a “cat door” can be installed through an exterior wall to provide access. Seasonal or year round? This will determine the type of roof and walls. Kitty Furniture – Ramps are great for the older, less able pet. Don’t forget other kitty furniture, like a condo, a doghouse, or a tree limb for climbing or scratching! We recommend that the enclosure has 3-4 sides and a roof. Cats have amazing climbing skills (as do some other critters) and you want to make sure that kitty stays inside where she or he is safe and the other critters, like raccoons, stay out. 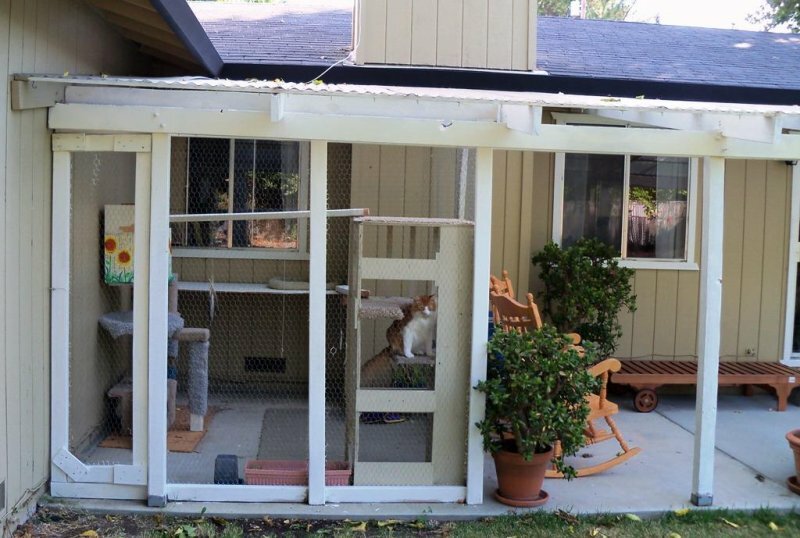 Really well planned enclosures can be an oasis for family and pets. Lattice walls and ceilings with lights and ceiling fans make an attractive patio room. One builder created a 14′ x 8′ patio covered enclosure in one afternoon, spending less than $200! Another, used scraps for their outdoor enclosure! Check garage sales or Craigslist for “free” items such as carpet remnants, cabinets (which can be converted into kitty-condos), and rope and wood for scratching posts. Figure 1: Constructed off living room window onto existing patio. Used chicken wire and 2x4s. Figure 2: Tower is a bathroom vanity, turned on-end. The condo on the right is made from an old speaker box, a satellite dish, wine cases, and carpet remnants. Figure 3 & 4: Constructed off living room window onto existing patio. Used chicken wire and 2x4s. Figure 11: This enclosure is made out of coat-wire ventilated closet shelving purchased at a hardware store or Home Depot. Total cost is about $400 for 5′ deep X 8′ long X 6′ high. See more here.